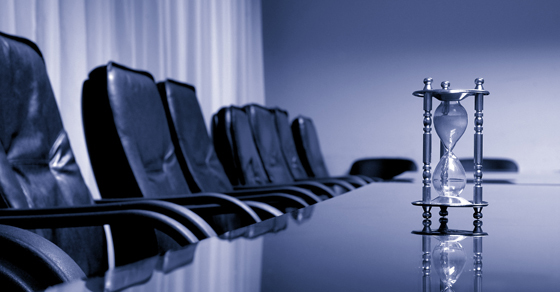 Finding and retaining good board members can be challenging for not-for-profits. So it’s important not to make the job harder and more time-consuming than necessary. This starts with efficient board meetings. The key to effective board meetings can be summarized in one word: planning. Once the meeting date is set, your executive director and your board chair should prepare an agenda. For each item, the agenda should provide a timetable and assign responsibility to specific board members. Include at least one board vote to reinforce a sense of purpose, but be careful not to cram too much into your agenda. Distribute board materials at least one day before the meeting. The package should include the agenda, minutes from the previous board meeting and materials relevant to new agenda items such as financial statements and project proposals. Some board members have little time to spare, but most will welcome the opportunity to get to know their colleagues. This can be accomplished with a short pre-meeting reception. Staff should help facilitate communication by introducing new members to the group. Once the meeting starts, it’s critical that your executive director and board chair stick to the agenda and keep things moving. They should impose a time limit on discussions and call time when necessary — particularly if one or two individuals are dominating the conversation and discouraging others from speaking up. A vote should be encouraged after a reasonable period. But if your organization requires a consensus (as opposed to a majority vote), the board may not be able to reach a decision immediately. If members need more time to think about or research an issue, postpone the decision. Finally, end the meeting on a positive note: Remind board members why they’re there and thank them for their time. Board meetings can’t be effective if there’s no follow-up. Be sure to find answers and supporting materials for any questions that might have arisen during the meeting and place unresolved items on the next meeting’s agenda. For more help with board of director and governance issues, please contact us. Work with professionals who know your industry. Learn more about our Not-for-Profit team.